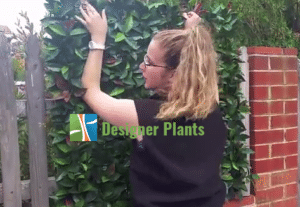 Many customers are surprised when they find out there are various different artificial plants and hedges in the marketplace. To help you choose the right hedge, we have come up with this blog around 5 things to look out for when purchasing artificial hedges. Many arttificial plants look similar when you view them from far away. When purchasing hedges ensure you are purchasing enough to fill the space you require. You can work out how many hedges you will need with our hedge calculator here. 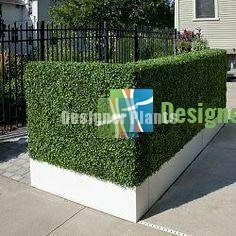 A decent hedge with several layers will mean your space will be filled with the privacy you sought after with your purchase. By looking at the number of layers, you can be assured that you will fill in the gaps or wall you are covering. On the right, you can see our range has 4 layers, compared to a competitor with three. The quality of your hedges is important. Ask the provider what type of materials they use to make the hedges. Material like that shown below on the left which are recyclable alone will tend to fade away and start cracking quicker than more durable plastic. At Designer Plants we use virgin plastic as it is stronger than fully recyclable plastic and can withstand weather such as hard rain, hail or storms. Notably, virgin plastic is still recyclable. However, you need to take it to a recycler, similar to how you would recycle tyres (not via your home recycle bin). The council will be able to help you. However, you won’t need to worry about this unless you want to remove the hedges or replace them a few years down the track. Only buy from reputable providers you can trust. Cheaper hedges claiming to be the same quality, will not always be better. When purchasing artificial hedges, always look out for a product warranty and guarantee. Also be wary of any hidden clauses by reading the providers guarantee terms in full. At Designer Plants our boxwood hedges, artificial green screens, hedges and faux plants are all covered by our 5-year product guarantee from fading and cracking. 5. Check for chemicals or substances like lead and mercury. Purchasing artificial hedges should be earth friendly. However, to save money some manufacturers use lead, mercury or other harmful substances in their products. At Designer Plants, we are ROHS compliant. This means “restriction of hazard substances”. Our hedges contain no unsafe chemicals or toxic materials. Thus, giving you the confidence you need in having earth friendly hedges. When it comes to purchasing artificial hedges, no two ranges are the same. At Designer Plants, we’re committed to delivering the highest quality product each and every time. We remain a leader in the artificial and fake plant industry and we’ll always strive to live by this promise. ← Why going green is more than a lifestyle choice?